We installed a 2kWp PV system for a customer in Nottingham in July 2012. 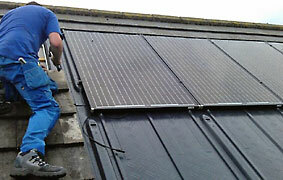 We installed 8 x 250w Solarworld ‘in roof’ panels. The in roof panels are slightly different to the on roof panels. The on roof panels are mounted on rails and brackets that are fixed directly onto the existing roof tiles. The in roof system is installed by removing the existing roof tiles and inserting a tray like mounting kit in place of the tiles. The panels are them fixed into the tray and secured as necessary. This provides a more discreet, flush looking installation that blends into the roof. Everything else works in the same way as a traditional style installation and the performance is the same. Our customer installed their system in July so are eligible to receive the feed in tariff generation rate of 21p and an export tariff of 3.2p, guaranteed for 25 years and adjusted with inflation.